Matt McCarten's UNITE union focuses on youth and low paid workers in the service sector. UNITE is also heavily infiltrated by the Maoist/Trotskyist Workers Party. Meanwhile the Pure Trotskyists of Socialist Worker have started their own union to organise low paid factory and industrial workers. The new union is called "Solidarity" and its only two officials are Secretary Grant Morgan (leader of Socialist Worker) and Campaigns Officer Joe Carolan, formerly with UNITE and a prominent member of Socialist Worker. After a street by street, factory by factory recruitment campaign, Solidarity has begun to flex its muscles. 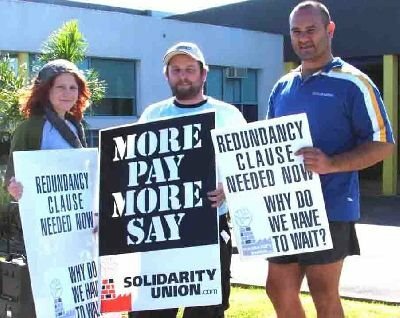 Solidarity Union activists today protested at the Management Headquarters of MetroGlass iin Auckland's East Tamaki, to highlight the new Australian owner's intransigence on providing an adequate redundancy provision in their contracts. MetroGlass was recently sold for over $350 million to Australian speculators Catalyst Investments, in a surprising move that startled and upset workers. "We have seen what happened at Feltex, and at Progressive, and workers in MetroGlass are concerned that despite repeated management promises the company would not be sold to overseas owners, it was. Now there is promises of no re-structuring or redundancies. Well, if this is the case, it won't cost MetroGlass a cent to include a decent redundancy clause in these workers contracts, since they promise they have no intention to lay anyone off". "We've been waiting four months for management to get back to us on this issue", said Solidarity Union's Joe Carolan. "85 workers signed a petition in October in favour of a 10 by 2 redundancy agreement- 10 weeks pay for anyone laid off, with a further 2 weeks on top for every additional year worked at the firm. MetroGlass is one of Auckland's leading glass companies- the workers there think they should also lead the way in conditions and pay." Solidarity with all the workers at Metroglass. Absolutely despicable the way the company has screwed them out of their redundancy rights. Solidarity Union has got some good dedicated people working for it. Pity I wasn't able to make it out to the picket. Hopefully it will get lefties, righties and people who don't swing either way thinking. What are these things called "redundancy rights" Cameron? NOt sure if Socialist Worker are as much Pure as they are Pragmatist "Trotskyists", whatever that means, Uncle Trev. Recent moves in the SW camp have seen them move away from propaganda style abstract generalisations to building small but potentially useful movements- such as Climaction or this Solidarity campaign in South Auckland. UNITE! seem to be concentrating more on service style operations- Hotels and Fast food, whereas their comrades in Solidarity are looking out to South Auckland. I wonder if this is part of an agreed plan between McCarten/Treen and Morgan/Carolan? You might be the last to know, but there are rumours that there has been a change of leadership within the Pure Trotskyists also, with the young guard now "flexing their muscles" too. Why do these johnny come lately s who just turn up for a wage without taking on any of the companys other responsibilities think they have a right to a greater say...? Arrogant bludgers I call them. Decembers Child-Thanks for that. If true that would be a sensible division of revolutionary labour between the UNITE and SW camps. Rings True to me. Interesting re leadership change in SW. Its a bit like the Godfather-the Don being "clipped" by the young turk. Poetic as Morgan did exactly that to the Stalinists of the CPNZ "old guard". As in cut off his nuts? No-don't you watch Sopranos?-clipped as in "whacked". Believe the leadership change at SW was a more amicable affair- GM retiring and passing on the torch, more than a ruthless back room plot. But on the Soprano's vibe, don't ask Johnny Two Times to do anything for you. Last week, I had business in Vegas, so I told him to "take care of" my elderly grandmother. He whacked her. Ever wondered why UNITE seem to want to recruit low skilled people who are not exactly well educated while the leaders of it have spent much of their lives at University? You all know the answer!